The water tower lays at the South Western corner of the abbey precincts, and marks the end of the Marygate walls at the river's edge. The tower is thought to have been built sometime between 1318 and 1324. Above. A view of the Water tower from the Yorkshire Eye across the river Ouse. The tower is circular in plan, with a hexagonal interior. There are five arrow slits in the thick walls, and a door to the rear. Above. The tower from the river side showing one of the huge arrow slits. 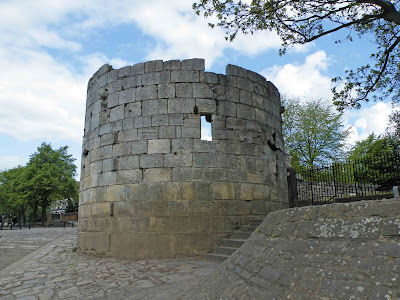 The small postern attached to the tower, shown above, is of no great antiquity. The tower is thought to have originally been crenelated, although the top portion of the structure is now missing, and was also two storey high. Above. Another view of the Water tower from the river side. 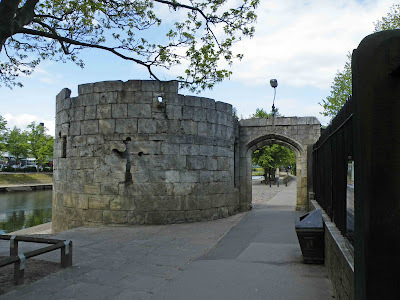 The tower is accessible from the footpath that runs West along the river from Lendal Bridge. Marygate is then directly accessible from this point....just in case you want to continue your walk around the walls!